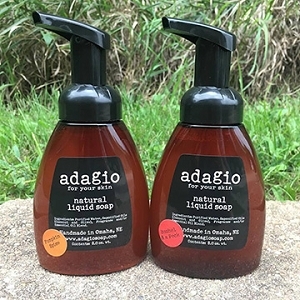 We formulated our natural liquid soap for convenient hand washing. Our simple formula is perfectly balanced to clean without stripping. Available in the following scents: Almond Tangerine, Amber Earth, Blackberry, Coconut Lemongrass, Coconut Lime Verbena, Ginger Peach, Hippies & Cowboys, Jasmine Vanilla, Lavender, Man, Orange Lavender, Patchouli, Purple Clover, Sandalwood, and Verbena.